We’ve been using the KidCo Peapod tent as our toddler travel bed since our son was 14 months old. We’ve loved how lightweight and easy to pack the KidCo PeaPod is for traveling with a toddler. Our now 3.5 year old still doesn’t object to sleeping in his tent (which is good until 5 years old), but we can tell he would rather be in a bed. He is a big boy after all and sees his older sister sleeping in a regular bed. This was just one of the reasons that prompted our decision to look for a new portable toddler travel bed. 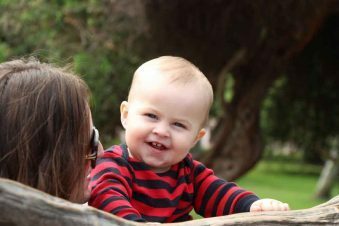 Not at the toddler stage yet? Or if you still want to keep your little one in a toddler travel cot, you can find the best lightweight, portable travel bed options for your baby or toddler in our list of best baby travel beds. Many of these will last into the early toddler stages and are the most popular and highly rated. 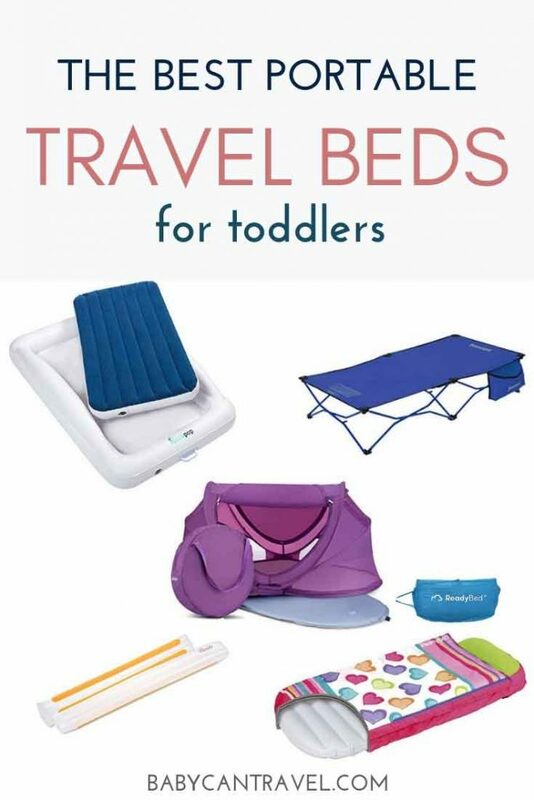 Once your toddler is moved into a toddler bed at home, you’ll want to come back here and take a look through this list of best toddler travel beds. You might be wondering why you would need a portable bed for toddlers, especially since your toddler is sleeping in a bed at home perhaps with or without toddler bed rails. Here are our top 5 reasons to purchase a portable toddler bed. 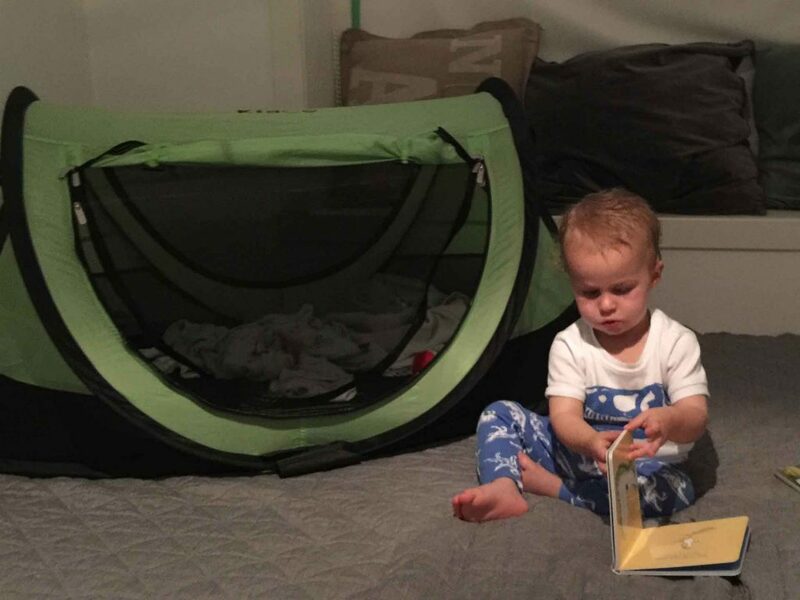 If we are honest, though it’s rated up to 5 years old, our toddler travel tent (the KidCo Peapod Plus) is starting to feel a bit small for him. Though the KidCo Peapod travel bed fits easily in a suitcase, we have transitioned to using our backpacks more for our trip. This means we either need to carry the tent separately or pack a second backpack to fit it in (thankfully it fits in my husbands backpack). When we stay in hotels, we can make a room with two double beds work but our toddler kicks a lot. This means whoever has to share with him isn’t likely to get a very good nights sleep. We do try to stay in a mix of hotels and airbnb apartments with our kids, but it’s not always possible to find an apartment with enough rooms or beds within our budget. It’s sometimes cheaper for us just to bring a travel bed with us. As mentioned above, our toddler is starting to want to sleep in a bed not his tent and we want him to be happy to go to sleep (well, as much as can be expected). Traveling with toddlers isn’t always easy, so we want to reduce the potential battles as much as possible! Want to know more about the KidCo Peapod Plus? Read our full review of the KidCo Peapod Plus for travel with a toddler. Your toddler may be too tall for a pack n’play or travel cot. You can still give your toddler a familiar sleep environment, this is especially important for the young toddlers. We’ll give you a list of the options that we considered for our toddler travel bed and at the end why we made the choice that we did. A list of the most popular & best rated Toddler Travel Beds. *Highly rated travel beds have a minimum of 75% 5 star reviews. Most of the inflatable toddler travel bed sleep solutions are basically a toddler air mattress with sides and a few other additional features. There are several of these that come up in any search, so we looked at the top rated inflatable toddler travel beds on Amazon. The two well know companies that manufacture a portable blow up mattress for kids with built in bed rails is Shrunks and hiccapop. We also considered the Toddler Ready Beds. In case an inflatable mattress aren’t what you are looking for, we also looked at travel tents for toddlers and foldable cots for toddlers. Readybeds makes two different sizes, with the Readybed JR made for 3 to 6 years old and the My First Readybed for 18 months to 3 years old. Both are a toddler air mattress and sleeping bag in one, so you don’t have to worry about extra blankets. The My First Readybed has a bumper that runs around the top half to prevent toddlers from falling out. Both the Readybed JR and the My First Readybed have a removable and washable cover, though most of the critical reviews were related to the poor quality and zippers that didn’t work. The other complaints were around the pump and also the quality of the mattress. If you don’t intend on using this frequently, for the price and the small size these are a nice option. For a lower price they come with everything you need and they weigh almost a third of the other inflatable toddler beds with rails. If you plan to travel frequently, we recommend looking at one of the larger toddler blow up beds. The hiccapop Inflatable Toddler Travel Bed has a lifetime guarantee and is very highly rated with most of the reviews being 5 star reviews. It’s only 8 lbs and comes with a travel bag and electric turbo pump. It has one of the highest weight capacities at 310 lbs and claims to be 40% thicker than the Shrunks inflatable toddler bed. You can use standard crib sheets with this one (as well as the other ones below). The only major issue with the hiccapop (and all of them for that matter) is that they specifically state that the pump is not compatible outside the USA, so you might need to use a foot pump for inflating. I’d say the Shrunks Toddler Travel Bed is the most well known and is very similar to the hiccapop in that it gets a decent amount of 5 star reviews and weighs only 8 lbs as well. It also comes with a travel bag, repair kit and Jetaire Electric Pump. The weight capacity is only 150 lbs, but that’s more than enough. They also have a lifetime warranty. The other two inflatable toddler beds for travel that we looked into were the Little Sleepy Head and Pookabee inflatable mattress. They both have similar sizes as the hiccapop and Shrunks with bed rails. They weigh slightly more at around 9.5 lbs. The Little Sleepy Head comes with a sheet as well as the electric pump and travel bag. The Pookabee comes with a memory foam pillow in addition to the pump, travel bag and repair kit. These two don’t have enough reviews to choose them over the other two highly rated inflatable toddler beds and there are two recent reviews on the Little Sleepy Head that claim it doesn’t stay inflated. I’ll be honest up front, I wouldn’t consider one of these foldable toddler beds for travel but felt compelled to include them because I had done the research on them. I spent a lot of time reading up on the Regalo Toddler Cot and Joovy Foocot toddler travel cot. They are going to be too big to fit in a large suitcase and I’d be worried about my toddler falling off with no bed rails. If a folding toddler bed is what you are looking for, you could always carry it separately. And since they are rated to about 8 years old, they would be a good kids travel bed to leave at Grandma’s house. They are easy to unfold and set up plus they don’t require a pump. The biggest complaints about these two folding toddler beds were the middle section that seemed to be pulled too tight making it higher than the rest (and therefore less comfortable) and the quality, especially when it came to extended use. Many of the critical reviews commented on poles bending and bolts loosening. As mentioned earlier, we loved our KidCo Peapod Plus tent for travel with a toddler, so I felt it important to include it in this list. There are really only two toddler travel tents that stand out and those are the KidCo PeaPod Plus and the Joovy Gloo – Large. Both have a smaller version that goes until the age of 3 years old, but I would suggest going with the larger option to extend the use. These two are so similar, but there are a couple of important features where they differ. One key difference between the KidCo Peapod Plus tent and the Joovy Gloo is that the Joovy Gloo is rated from 0 to 5 years old, where the age recommendations for the KidCo Peapod tents starts at 1 years old. The other differences are that the Joovy Gloo is at a higher price point and is almost 2 lbs heavier. If you are considering a tent, I will say that my biggest complaint about it was the sleeping surface. I always put a blanket down because the nylon seemed to make my toddler sweat! 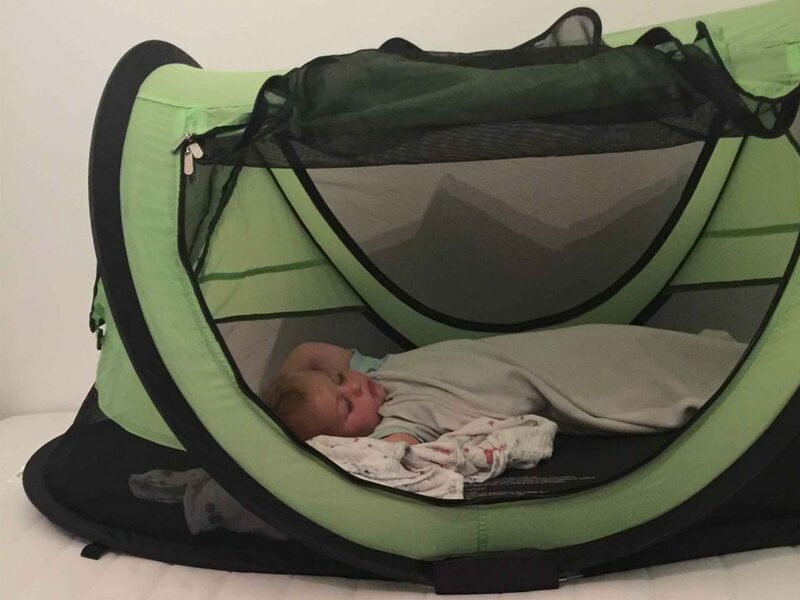 You would not want to do this if using a travel tent with an infant and use a sleep sack instead (go with the Joovy Gloo if you are planning to use it for under 1 years old). Secondly, the sleeping surface of the KidCo Peapod Plus is not very thick. In most instances, this was not an issue except when we were staying in a place with tile in the bedrooms or hotel rooms. In these instances, we would lay a thick blanket down underneath (again, only do this for older toddlers for safety reasons). The Joovy Gloo has a self inflating mattress, so this might offer more comfort. A list of the most popular & best rated Inflatable Bed Rails. *Highly rated inflatable bed rails have a minimum of 75% 5 star reviews. If you know you’ll have a bed for your toddler, portable bed rails for toddlers are a great solution to keeping your toddler from falling out of bed. Even if your toddler doesn’t fall out of bed at home, an unfamiliar sleep environment may have your toddler rolling around a lot more. 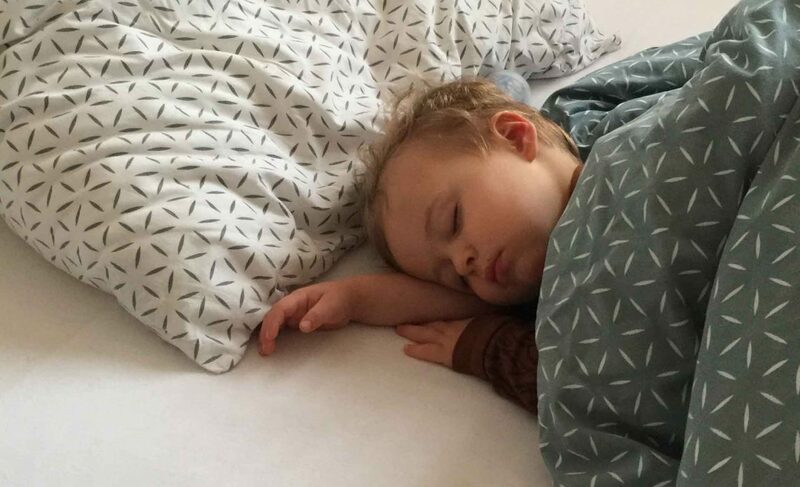 There have been instances where our toddler was in a larger bed than at home and we thought he’d be just fine, but he still managed to fall out. We have rolled up towels or folded pillows, then inserted under the fitted sheet to use as bed rails. For us this has been an easy travel hack, since this keeps our toddler in. If your toddler does move around quite a bit or if there’s the chance you won’t have these extra available (this can be risky if staying in an airbnb) then these inflatable bed rails are a lightweight and easily portable option. We have four different sets of inflatable bed rails for toddlers listed in our chart above. The Emma + Ollie inflatable rails, the Shrunks inflatable kids rails and the Royexe inflatable baby bed rails all have non-slip grip strips (say that 5 times fast!) on the bottom of the inflatable rail. The hiccapop inflatable bed rails are slightly different in that it has a thin fabric cover with silicon strips under the rail plus a safety extension that would go under the sleeping area. These extra safety measures are a nice feature! For me the choice between these inflatable bed rails for toddlers would be an easy one. The hiccapop bed rails offer a lifetime guarantee, they are the most highly rated with a decent number of reviews (most of which are 5 star reviews). 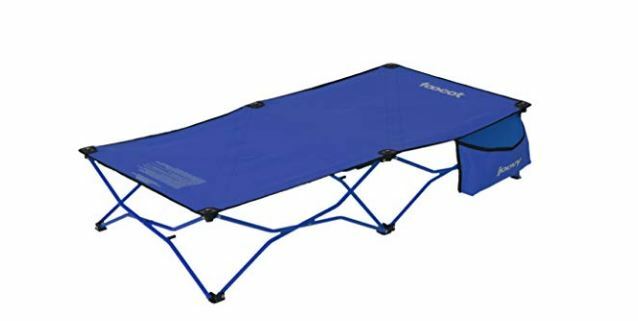 Keep in mind that these bed rails do not come with a pump (except the Shrunks), but in reading the reviews further, most people comment that it was easy to blow up. It is slightly more expensive, but given they all have some reviews that they deflate, it’s worth the extra $10 to go with the best reviewed one that also has the best guarantee. For us, we knew that we had trips planned with accommodations that wouldn’t have enough beds for all of us, so the bed rails weren’t what we needed at this time. We knew we wanted an inflatable mattress that we could use as a toddler camping bed (so we wanted it thick enough) yet small enough to pack in a suitcase and carry along with us when we fly. Don’t forget to read our posts on Flying with a Toddler, Travel with a Potty Training Toddler and Toddler Travel Essentials! We loved our KidCo Peapod Plus and are sad to say goodbye to it, but the inflatable mattresses are the best portable toddler travel bed option for us. Due to being in Canada and having different options, we went with the Shrunks Junior Toddler Travel Bed. We liked the lower price point and the fact that it came with a sheet and foot pump. We purchased ours from Walmart. If we were in the USA and had the ability to purchase from Amazon US, we would have went with the hiccapop toddler travel bed. 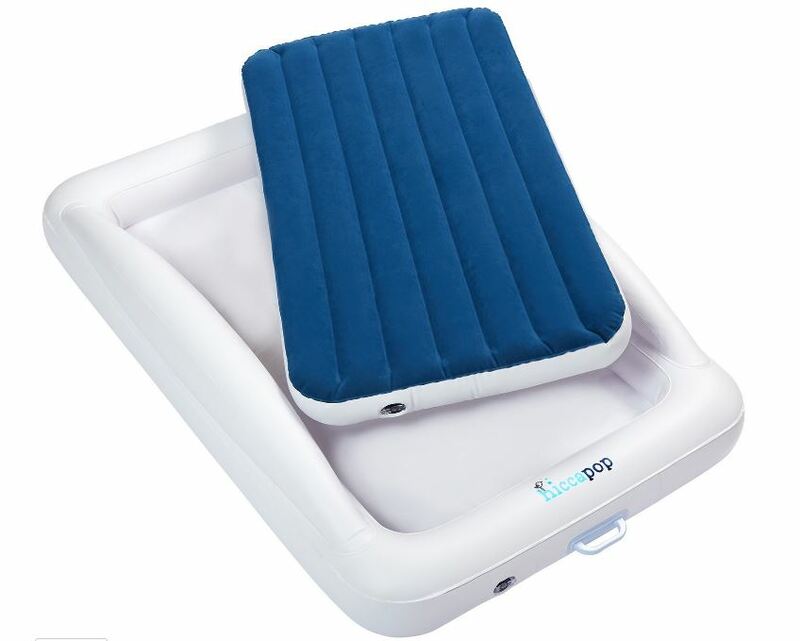 The price for the hiccapop in the US is similar to the Shrunks Junior Toddler Travel Bed we purchased (even after the exchange) and it’s definitely the highest rated inflatable toddler travel bed. Shop our entire list of Toddler Travel Beds & Accessories on Amazon!